The White House announced on Friday that all of ISIS caliphate territory in Syria has been “100 percent eliminated”. Spokeswoman Sarah Sanders confirmed in a press briefing that President Trump had been notified and briefed by US Acting Defense Secretary Patrick Shanahan while en route to Florida aboard Air Force One. Sanders confidently told reporters that ISIS' "territorial caliphate has been eliminated in Syria." US-backed SDF forces have for the past weeks been waging a fierce battle on Baghouz camp, which US coalition statements have described as the last holdout to the "most hardened" ISIS militants, numbering in the hundreds, in Abu Kamal District of Deir Ezzor governate near the Iraqi border. 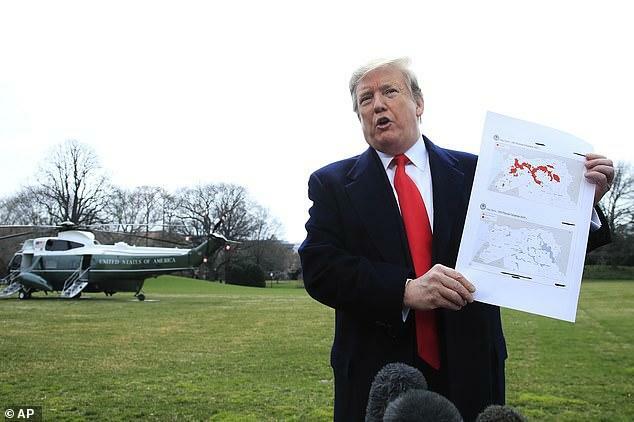 Previously in the week on Wednesday, Trump said that this last tiny ISIS enclave would be “gone by tonight.” Soon following this, reports indicated that the US-backed SDF “liberated all of Baghouz from the ISIS mercenaries”. Stunning scenes have come out of Baghouz over the past weeks. But on Friday both the Syrian government and Russia's Foreign Ministry downplayed such reports. At a moment the Pentagon claimed victory, Moscow officials said "the US announcement about the complete elimination of Daesh is not very convincing," according to state-run media. Syria's envoy to the UN, Bashar Jaafari, called Friday's claims of a total ISIS defeat in Baghouz and the region a "bluff". Regardless, the scenes of coalition bombings, Kurdish-led advances, and terrorist mass surrenders have been stunning over the past week. It's clear that ISIS is in it's final days, not discounting the potential for an underground "endless insurgency" that may continue to rattle Syria and the region for years to come. But still the months-long question remains: when are US troops actually coming home as promised by Trump on many occasions? No one should hold their breath.